Multiple high-profile fire tragedies have hit the headlines over the past two years, serving to highlight just how vital fire safety continues to be. Featuring an introduction by Gerry Dunphy, event director for FIREX International. Download the eBook to keep abreast of best practice and fire regulations, which can inform your fire safety strategy for 2019. For more fire safety education and insights visit FIREX International 2019, Europe’s leading fire safety event, taking place 18-20 June 2019 at ExCeL London. Book your free ticket now. 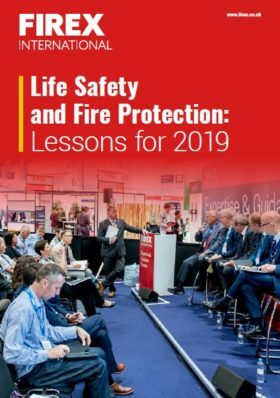 Life Safety and Fire Protection: Lessons for 2019 This eBook outlines some of the critical conversations that took place at FIREX 2018 and what they mean for the fire safety industry going into 2019. It includes key takeaways from presentations and product demonstrations across three days at London ExCeL, plus insights from IFSEC Global.